The application of ultrasound technology to obstetric and gynacologic issues figures as one of the staples of this imaging modality. 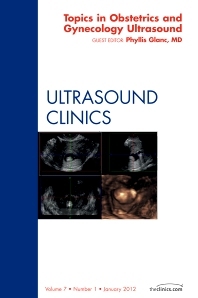 This issue of Ultrasound Clinics features the following articles: Demystifying Ovarian Cysts; Fetal Measurements and Anatomy; Fetal Echocardiography; Management of Threatened Miscarriage; Gestational Trophoblastic Diseases; Sonographic Depiction of Ovarian And Uterine Vasculature; Postmenopausal Endometrial Bleeding; and Pediatric Gynecologic Ultrasound. Acute Right Lower Quadrant Pain, and Early Anatomy Ultrasound.